Every carrier and retailer in the United States had deals on Samsung's current flagships, the Galaxy S9 and S9+, so if you've already caved in and took one of the promotional offers, the only thing you can probably do now is to compare prices. The unlocked version of Samsung Galaxy S9+ is on sale on eBay for a price that usually requires trade-in or signing up for a new two-year agreement with one of the major US carriers. 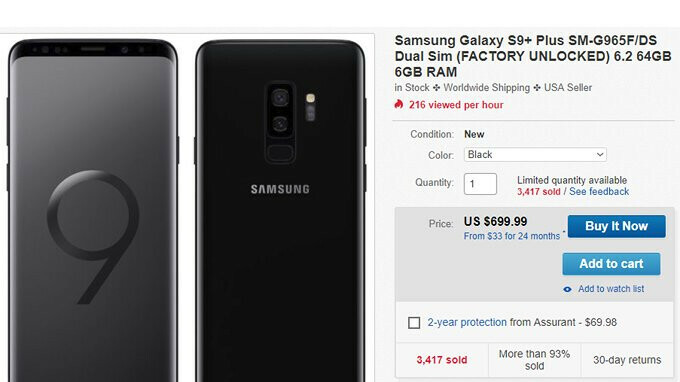 eBay seller ironically named never-msrp is now selling the Galaxy S9+ for just $700 outright. Compared to the price of $900 that US carriers usually ask for the Galaxy S9+, this deal seems pretty decent and it doesn't require a long-term agreement or trade-in. There's one caveat though, as the unlocked model will only work on GSM carriers like AT&T and T-Mobile. It's also worth noting that those who want to go for the eBay deal will be able to choose from two available color options – Black and Blue, as Gray and Purple are already out of stock. The seller's name is not ironic. The name is appropriate. This is exactly the behavior that a seller named "never-msrp" should have. forgot to mention Samsung Pay won't work and exynos is actually inferior in terms of performance to snapdragon on the s9 series. Yeah, all that is true. Despite that, I still chose the international model because it gets updates really fast. I'm on the May security patch while the US model is still stuck on February. I’m not going to start a new arugment, but Exyonse 9810 aren’t inferior in terms of performs to snapdragon 845 actully it’s better. If your not using so don’t judge I used it for a week and compare to my note 8 Exyons in terms of performance and gaming it’s better plus there’s no throttling like snapdragon in heavy tasks or gaming. Piyath just wondering why you hate Samsung? tell you somthing even if you hate Samsung galaxy and note line still remain the most selling android phones (forget about mid range and low range) around for a reasons, yeah there’s a lot choicese of Android smart phones, but when it comes to resale value, phone spare parts and customer service Samsung remain Apple of android. Btw note 8, S8/ S8 plus and S9\ S9 plus Exyons already got May security batch. This deals been on for about a month, nothing new. I actually got my S9+ from them when they lowered the price, great experience. No, that's not what he meant. Go be a lame troll somewhere else.